If commercial agriculture is defined by the organized growth of a certain plant or group of plants then the Genesee Valley isn't necessarily the spitting image. For centuries, nature has provided the right ingredients to yield a diverse species of grasses ripe for grazing. The careful stewardship of pioneer rancher Edwin D. Hosselkus and generations of Northern Maidu Indians gently developed the land with true sustainability. You are what you eat is most true in grass-fed cattle. The cow's balanced development is defined by far more than just calories. Marching cattle into a cultivated pasture, growing knee high with acre after acre of the same perfectly cloned grass is about as exciting as a salad with one ingredient. Wagyu cattle are grazing animals with instinct built deep into their psyche. Give them natural diversity and amazing things begin to happen. Suddenly every cow in the herd appears to have a masters degree in grassland nutrition as they graze the field in unique patterns. So if nature's balance is so perfect and the cattle seem to know exactly where and when to graze, why do we need advanced airborne spectral imaging? This is exactly the question I asked after my first meeting with ranch/herd manager Michele Haskins. 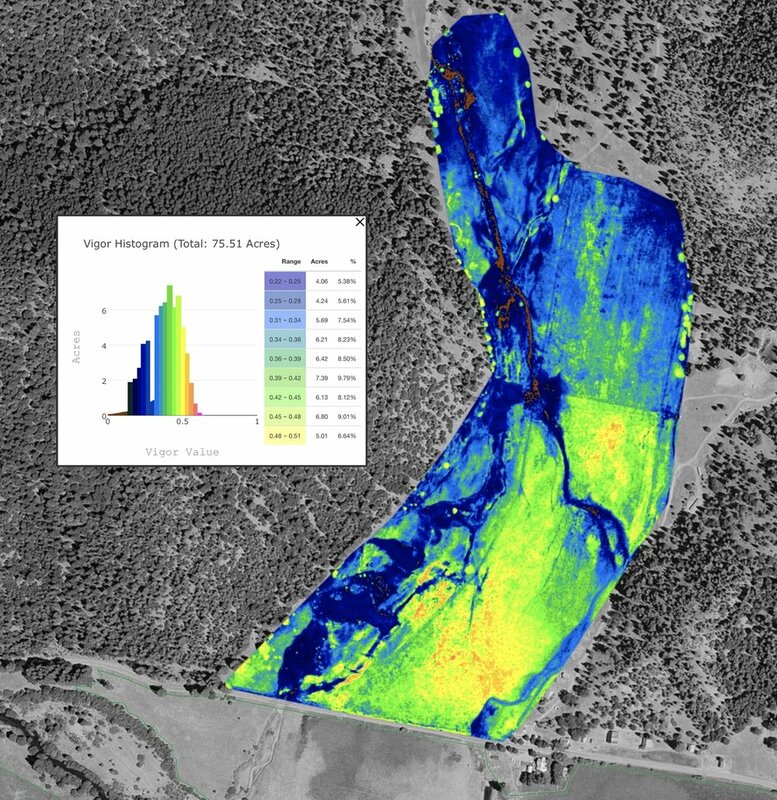 I had just finished my first year with VIGOR (vineyard infrared growth optical recognition), software I had developed for Palmaz Vineyards to use weekly flown aerial infrared imagery and correlate soil moisture to predict plant by plant irrigation levels. VIGOR had been a smashing success in the vineyard environment but considering it was only looking at really only two plant types, vineyards and cover crops, I was skeptical of it's ability to be useful in natural rangeland. After spending a week looking at a dozen or so different species of grasses growing in different areas of the valley and hearing Michele explain how each provided a different nutritional value to the cow, I began to understand the necessity in monitoring each of these areas. She also identified some invasive species such as star thistle which the cows enjoy grazing before they become thorny. A week later we flew our first mission with the camera. The data was amazing. I had never seen such diversity in an agricultural setting. We went to work immediately identifying each species by it's relative infrared signature. Suddenly we had maps for invasive species overlaid on grazing plans. It was clear, just as we concluded with the vineyard application, we needed subsequent imagery throughout the year to really unlock this potential. A month later we had our second image. Not only could we see the development of certain areas over others as influenced by our irrigation but we could see the areas the cattle favored. Immediately we began changing the cattle grazing schedule to maximize on the bloom of a certain species they prefer during pregnancy or calving. We ordered 6 more images that year. Now into our second year we are finding new ways to identify patterns in the cattle behavior and changes to the natural mix of native species of grasses they graze. In the vineyard we use VIGOR to maintain infinitesimal amounts of ripening difference between vines in a parcel. Now it's roll in the Genesee Valley is tuned for diversity. Armed with naturally diversified rangeland, the formidable Wagyu instinct, and an eye in the sky, our "grass-fed" beef has reached for new meaning.